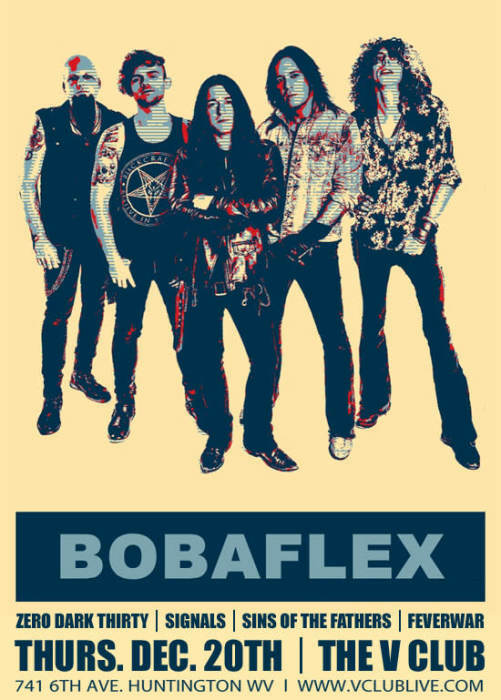 West Virginia hard rock band Bobaflex combine classic rock & roll and nu-metal influences on a hard-charging sound that evolved after their debut. The band was formed by brothers Shawn "Beaver" McCoy and Marty McCoy, direct descendents of the McCoy family from the famous Hatfield-and-McCoy feud of the 19th century. Shawn, on lead guitar, and Marty, on bass guitar, were joined by drummer Ronnie Castro and co-lead singers Lutz and Drebbit, and the quintet made their debut on June 5, 1998, in Huntington, West Virginia, playing rock in a rap-influenced nu-metal style. They built up a following in the tri-state area of West Virginia, Ohio, and Kentucky, and self-released their debut album, Bobaflex, in August 1999. Later, at a gig, they met Shifty Shellshock, lead singer of Crazy Town, who helped them get a production deal and got them into discussions with Columbia Records for a record contract. In 2001, Michael Steele joined on guitar. The Columbia deal fell through when the band split over musical differences, with Lutz and Drebbit departing, while Shawn, Marty, Castro, and Steele, retaining the band name, opted for a more mainstream rock sound. Marty switched to guitar, and Shawn and Marty took over vocal duties, adding bass player Jerod Mankin. This quintet made the five-song EP Primitive Epic, which the band released in May 2002. That recording attracted the interest of independent metal label Eclipse, which signed Bobaflex in March 2003. Meanwhile, Castro left the band and was replaced by drummer Thomas Johnson. Bobaflex recorded new songs and remixed existing ones to expand Primitive Epic into their Eclipse debut, and the new full-length version of the recording was released in August 2003. Bobaflex went on to TVT Records, where they released two albums, 2003's Apologize for Nothing and 2007's Tales from Dirt Town, before leaving the label (which had filed for bankruptcy) in 2009. An EP, Chemical Valley, was issued on their own independent label BFX in 2010. They followed with 2011's Hell in My Heart, home to their single "Bury Me with My Guns On," and 2013's Charlatan's Web, which featured "I'm Glad You're Dead." Two years later, they released Anything That Moves. In 2017, they issued their eighth effort, Eloquent Demons.